In this ultimate collection, we bring you a massive selection of great Web design tutorials from all over the design community. All of the tutorials use Photoshop for the main application. By the end, you should have a pretty good idea of where and how to start designing for the Web. If you’re already an experienced Web designer, don’t ignore this post. Even the most talented and professional designers can pick up tips and tricks from others. After all, design is a field in which no one knows it all. Use Photoshop’s built-in custom shapes to add depth and interest to your design. Use the perspective tool to change the shapes and angles of otherwise simple objects. Create a torn-paper effect with the lasso tool. Create a warm glowing background texture using gradients, textures and brushes. Use custom shapes to produce your very own icons. Use some neat typography, combined with some grungy textures, to produce beautiful effects. Use the brush tool with custom brush packs to produce pretty swirl patterns. Use a load of great grungy textures in your design to add subtle but powerful effects. Use a gorgeous wood-textured image to produce a photo-realistic design. Create custom patterns to use as borders and separators. Use textures to create an interesting background and strokes to make certain areas pop! Use different blending modes to create awesome, colorful effects. Use simple techniques and textures to design a quick but gorgeous design mockup. Use one-pixel lines to separate different links in the navigation menu. Use blending modes to create stylish buttons with sleek highlights. Use gradients, drop-shadows and noise to create an awesome background and foreground objects. Use layer masks to add sleek reflections to your icons. Use borders and strokes to create a great abstract photograph pile. Use one-pixel borders to add a subtle detail to certain areas of your design. Use low- opacity block colors to make heading titles easier to spot and read. Use drop-shadows, inner shadows, gradients and strokes to create 3-D buttons. Use drop-shadows and gradients to create a stylish 3-D look. Use patterns to add depth and interest to certain areas of your design. Use a (Wacom) graphics tablet to produce a hand-drawn effect for things like the RSS icon. Use the marquee and free transform tools to create custom shapes and buttons. Create a great navigation menu using torn paper and hue/saturation settings. Create a simple and stylish blog theme, adding interest through gradients, strokes and textures. Use custom brushes and stock photos to produce a photo-realistic design. Use the artistic film-grain filter to produce awesome background effects. Use the rectangle and move tools to create a colorful background pattern. Use guides to properly set up your document for different-sized monitors. Use a seamless wooden texture to produce a beautiful background. Use a seamless pattern and some lighting-effect filters to produce an interesting background image. Turn custom shapes into patterns to add interest to your design. Use low opacities and strokes to add depth to your design. Use drop-shadows and inner shadows to produce a great letterpress-type effect. Use professional photo-montage techniques to produce a great header illustration. Use the brush tool to create a great eye-catching background effect. Make use of some great high-resolution textures to add depth and detail to your otherwise clean designs. Combine photos, patterns, textures and lighting effects to create elements that are perfect for a gaming website! Use the pen tool to edit anchor points and create custom shapes. Use scans and photographs of paper and other hand-drawn elements to produce an awesome abstract theme. Use the pen tool to create a design with a ton of funky shapes! Use grids and guides to keep your design neat and tidy. Use high-resolution textures to add depth and detail to your website’s background image. Use the burn tool to add dark areas to your abstract design. Use a pattern to add interesting elements to your Web design. Use typography to create custom shapes and objects. Use the pen tool to make a visually appealing header shape. Combine textures and built-in filters to create a gorgeous background. Use the warp tool to transform a simple shape into a realistic sheet of curving paper. Use different blending modes to make clean networking buttons fit in with a grungy design. Use a seamless textured pattern to create a visually appealing background image. Use drop-shadows and inner shadows to make header text stand out from other parts of the page. Use the noise filter to quickly and effectively add depth to your Web design. Use Web icons to add depth, interest and professionalism to your design. Callum Chapman is a self-employed blogger and graphic/web designer. He has recently launched a blog dedicated to visual inspiration for designers, photographers and artists called The Inspiration Blog. THANK YOU, THANK YOU SO muchhhhh!!! Awesome tutorials.. This is the mother of all tutorial collection.. 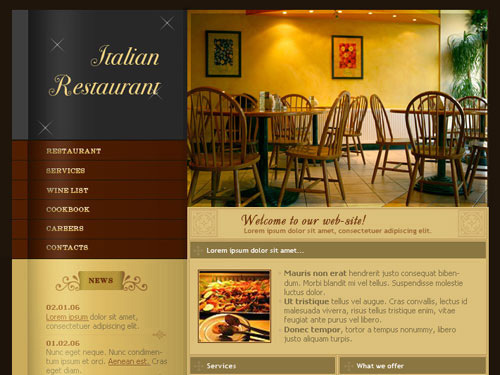 Thanks for sharing..
Great roundup of web site design tutorials. It’s always the time to learn something new. Thank You for this mine of inspiration! damn , grafpedia has hot tuts…thanks for the round up. Will share with students in class today! Great collection here thanks for posting! Wow, just what I needed! i will post here a demo very soon, maybe i will get some constructive feedback. Great list of sites, thanks for sharing! amazing collection of tutorials about website designing. Thank you for featuring some of my tutorials. After you posted some of my tutorials I was asking myself why my server load is so high. It’s an amazing, massive collection of blog themes and web design tutorials; thank you so much for sharing. Thank you for these wonderful tutorials. I spent that last few hours replicating one of the samples using Photoshop. I’m just wondering if there are any instructions on creating a website out of these samples. E.g – How do I create hyperlinks, etc? What format do I save it in after creating it in Photoshop? Any advice would be greatly appreciated. Thanks again. creative tuts for web designer i hope they can learn many things from these tuts. thats really ultimate… nice list. thanks to share! Some great web design tips. Perfect for beginners to web design and even some useful tips for design agencies. One thing to mention through is that very heavy use of image based fonts isn’t search engine friendly and quite a few of the designs utilise images for text. I love this post, it’s pretty useful for any kind of web designers, “Create a Grungy Personal Portfolio Design” is awesome. Stunning! it’s very insping, long life to Noupe!! My favorite one was “Design a site that looks like a generic website template”. This is a great list of helpful ways to make a design really pop. Thank you. I will remember this and come back to it for my next client’s site. Thanks so much for all of these! I’m experienced in web design and this was still a huge help. I especially like the “old paper” and “grunge” looks. I loved this post. Even after working in web design for several years, this post was extremely helpful and I got some great new ideas for designs. I’ll definitely come back here as I’m working on my next project. Thanks! It’s easy to create your ain healthy and downlike homemade Denny’s flapjacks with this easy-to-follow Denny’s flannel cake recipe with healthy ingredients, such as Graham and Canola Oil, served with a dollop of cream cheese and thoroughgoing maple syrup or love, or create your ain healthy pancake toppings. I found many useful & creative icons for my web project. Thanks for this post. Very helpful and informative. Glad to find out such good list of web design tutorials. Thanks for your hard work. Nice collection of web design tutorials. You have collected the best of them in one useful package. Many thanks for sharing these great resources. Nice collection of web design tutorials. You have collected the best of them in one useful package.